I am playing around with dipity recommended by Sam as part of a data collection exercise for Bolton’s Co-educate initiative a project that I am managing, one of 12 Jisc funded Curriculum Design Projects. One of the things we want to do is to run a series of focus groups both face-to-face and online to collect the history of the University of Bolton set in a context of UK HE policy, politics and technology. We believe that this is an important step in trying to understand the curriculum design process from inception through to delivery. If we want to find an agile and responsive way of doing this we first need to understand the complexity of impacting forces on this process. 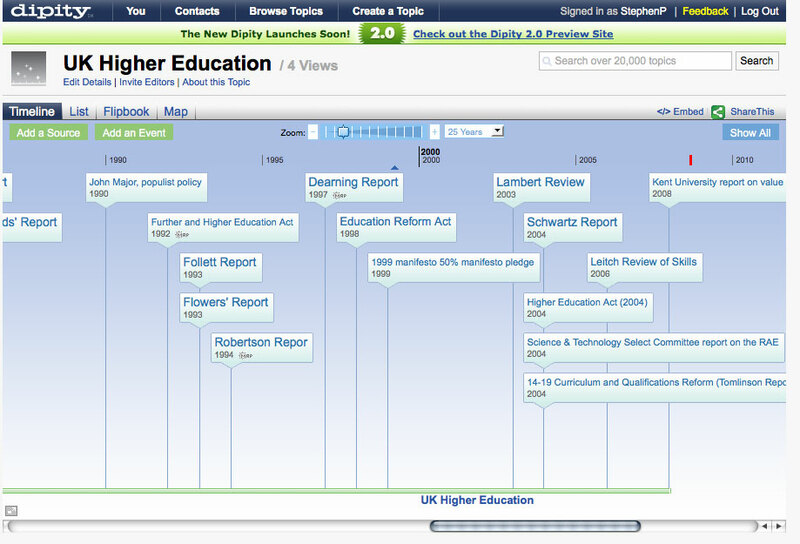 On completion we may well produce a ‘posher’ timeline using the MIT Timeline Project software, but this looks like a good starting point as it will allow is to collaboratively ‘remember’ this history. This entry was posted in Learning thoughts on September 23, 2008 by Stephen Powell. The platform has been built over 18 months Check it out and if you’d like I’d be happy to give you a demo with some of the events that I have chronicled. I’d love to hear your comments about the site.